In 2016 and 2017, our law firm was named the Avvo Clients’ Choice for family law matters. 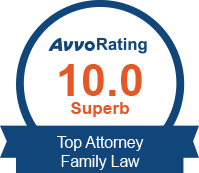 Attorney Wail Sarieh also has one of the top ratings for family law attorneys on Avvo. Our award-winning lawyers have over a decade of experience helping clients in Orange County. Our goal is to provide clients with honest and aggressive representation to help them move forward with their lives. Sarieh Law Offices is recognized as one of the best law firms in Orange County. Working with a lawyer from Sarieh Law Offices is a positive experience, according to the many reviews written by our clients. A divorce can be a very difficult and emotional experience, but working with the right Orange County divorce lawyer can make for a smoother and less stressful experience. At Sarieh Law Offices, our California family law attorneys deal with all aspects of the divorce process, including spousal support, legal separation, annulment, child custody arrangements and visitation, negotiating child support payments, domestic violence restraining orders and beyond. Our experienced divorce attorneys also assist with other related matters such as paternity and DNA testing issues, marital agreements, interstate custody matters, hidden assets and step-parent adoptions. Our goal is to provide you with the family law services you need to move on to the next stage in your life. To arrange a confidential, no-cost case evaluation, contact Sarieh Law Offices today by calling 714-542-6200. If you have been served with divorce papers you need to respond. There are few things more emotionally challenging than being served with divorce papers, especially when you’re not expecting it. You may also be frightened at the prospect of losing custody of your children or making ends meet on your own. These are all legitimate concerns. If you have been served divorce papers in Orange County, California, it’s essential to take action quickly because you typically have a period of just 30 days to respond. Failure to act in a timely manner can compromise your legal rights. The elite team of Orange County divorce attorneys with Sarieh Law Offices are committed to guiding you through the divorce process. We are here to answer your questions, offer legal advice and help you ensure the best possible resolution to your divorce case. Arrange a confidential, no-cost case evaluation by calling Sarieh Law Offices at 714-542-6200. When going through a divorce in Orange County, California, the process can take many months to reach its ultimate conclusion. During this timeframe, it is typical for the spouses to begin the process of securing separate residences. As a result, you may need to approach the court to submit a Request for Order – also called an RFO – to implement temporary court orders for child support, spousal support, child custody or visitation. Based in Santa Ana, divorce attorneys with Sarieh Law Offices are here to help you submit a Request for Order. In addition, you may also need representation from one of our experienced family law attorneys in the event that the court orders you to attend mediation before the court will hear the RFO. Our legal team is here to offer advice, practical guidance and representation as you navigate this emotional and sometimes stressful process. If you’re going through a divorce and require help with an RFO, contact Sarieh Law Offices to schedule a confidential, no-cost case evaluation. Call 714-542-6200. Need information to modify child custody, spousal support, visitation or attorney’s fees? At Sarieh Law Offices, our experienced team of Orange County divorce lawyers are ready to assist with each and every aspect of your divorce or separation, including the division of assets, such as real estate, vehicles, finances and other assets. It is quite common to see a fair amount of disagreement when it comes time to tend to the division of assets. It is important that you are represented by a top attorney who can work to guard your interests while ensuring that you receive your fair share of the assets that you share with your soon to be former spouse. The issue of child custody is perhaps the most emotional element of the divorce or legal separation process. The family law attorneys with The Sarieh Law Offices are committed to helping you present a compelling argument to the courts as you seek to secure a favorable child custody or visitation arrangement. Child custody also has an impact on your child support payments – another area where we will work to secure a favorable court order. Additionally, our Orange County family law attorneys are also ready to assist with child custody negotiations through a cooperative mediation process. We are also available if you require help seeking a child custody modification. California is a “no fault divorce” state, meaning that you don’t need to have one party who is to “blame.” Irrevocable deterioration of the marriage is sufficient grounds for a divorce. In California divorces, only one party needs to be in favor of a divorce. Even so, divorces can often be very complex and emotional. Couples are often tempted to work with a single attorney, but your interests are often in direct conflict, making it impossible for a divorce lawyer to effectively serve both parties. When you retain your own Orange County divorce attorney, you can move forward with confidence knowing that your lawyer will work toward a resolution that is in your best interest. Our legal team will assist with all aspects of your divorce. We can also assist with summary dissolution divorces, which can be suitable for couples married less than five years, with no children and few assets. Adoption can be a wonderful option for growing your family, but it is not without complexities and potential complications. At Sarieh Law Offices, our family law attorneys are available to assist with a vast range of California adoptions, including stepparent adoptions. We are available to consult with foster parents who are seeking to adopt a foster child, along with individuals who are seeking to adopt a related child, such as a niece, nephew or grandchild. In cases where the adoptive parents would like to allow visitation for a biological parent, our Orange County family law lawyers can draft comprehensive post-adoption contact agreements. We also offer legal help if you are seeking to terminate the rights of an alleged father or wish to terminate your own parental rights voluntarily. As some of the region’s most well-regarded divorce attorneys, our goal is to help you to resolve all of the outstanding issues surrounding your divorce so you can move into the next season of your life with hope and optimism. Our team can also help with other family law-related matters, such as mediation, legal separations, child custody and child support modifications, adoptions and beyond. Our Santa Ana family law offices are easily accessible to clients since we are located in the Floral Park district of Santa Ana in Orange County near Bowers Museum and Rancho Santiago Community College District, approximately 8 miles from John Wayne Airport (SNA). Head southeast as you leave John Wayne Airport and follow the signs for Self Parking/Valet. Turn left onto N. Airport Way, and move to the left lane to turn left onto MacArthur Blvd. In about 0.5 miles, turn left onto Main Street and stay on this road for just under 5 miles. Then, turn left onto W. Chestnut Avenue, and make a right at the 2nd cross street onto S. Broadway. Turn right again, and you will see our office. To see what our clients have to say, read Sarieh Law Offices’ Google Plus reviews. Contact Sarieh Law Offices for a free and confidential consultation session so we can learn more about your legal needs. Call 714-542-6200.